The risk and downtime associated with server migration have prevented many IT organizations from making the move to cloud. Some have valid concerns about cloud lock-in. Still, without cloud, IT teams are less agile, less flexible and less able to meet the demands of their business. With so much C-suite awareness of the cloud competitive edge, IT can no longer avoid taking this step. Carbonite DoubleTake™ Cloud Migration Center quickly and easily migrates physical, virtual and cloud workloads over any distance with minimal risk and near-zero downtime. The streamlined process automates 100 manual steps into five easy steps, automating everything from server discovery to target VM provisioning to the ultimate cutover. 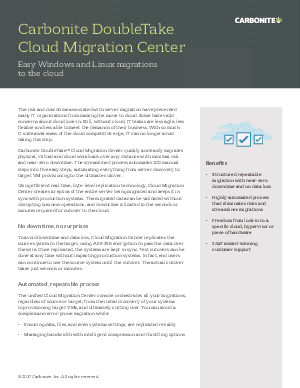 Using efficient real-time, byte-level replication technology, Cloud Migration Center creates a replica of the entire server being migrated and keeps it in sync with production systems. The migrated data can be validated without disrupting business operations, and downtime is limited to the seconds or minutes required for cutover to the cloud.